How to tie and fish them. The sight of a fish rising to a well presented dry fly is one of the most exciting for a river fly fisher. 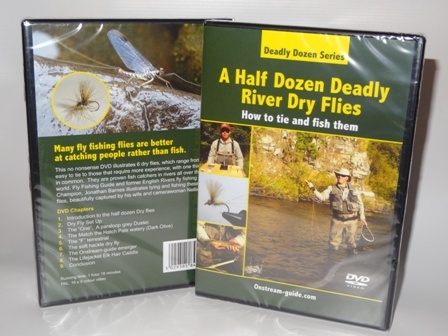 Our first DVD illustrates how to tie 6 very effective proven dry flies. Many of the flies are easy to tie and can be attempted by relative novices for example the “F” terrestrial. However there are flies such as “the one”, a paraloop grey duster which will challenge intermediate and more experienced fly tiers. The tying scenes are very clear allowing the viewer to emulate the sequences and recreate the patterns. The effectiveness of the flies is self evident and all the flies catch stunning wild trout and grayling!